@HoneyBunny, I spoke too soon. Avalanches between the Col and Bonneval mean you can drive to the top but no further. Lots of folks enjoying (or being beasted by race coaches) the first day of the summer season up on the Grande Motte this morning. Any news on the new brev gondola? @mountainaddict, Sorry no agents in country at the moment. @Timg60, No, nothing from the resort. But there was some 'Planning Notices' around at the end of the season advertising a consultation so I would be surprised if we saw anything new down there this season. Jonny Logan springs to mind!! I'm there this weekend. Will report back. Hopefully they are just behind schedule. Still being replaced here. Just a question re transfers to Tignes. Is it better from a transfer pespective to fly into Geneva, Lyon or Grenoble? @FrediKanoute, As ever it depends! If you are talking private transfer then Lyon and Grenoble are marginally quicker so its probably down to your choice of flight. If you want to use bus services then Geneva has Altibus a minimum of 3 services everyday and Ben's Bus as well on Sat/Sun. Lyon has Altibus/Ben's Bus (it's the same bus) on Fri Sat Sun. So really down to timings of flights and connecting services. Whichever you choose - avoid Saturdays if possible. Thanks for the advice. Unfortunately we are tossing up between driving or flying an Saturday is probably unavoidable for either. @FrediKanoute, GVA offers more choice of transfers I’d say. Also more UK flights. Other than that, Saturdays in/out of GVA I hate. The other two I find not quite so bad, if there’s a transfer to suit your preferred flights. Transfer time wise, not much difference between the three. I still have info on 6 GVA transfer operators from last winter. If any use to you, PM me. No update guys, sorry. We decided not to ski as it was so warm. It was 13degC at 8am and by lunch time was in the 20s. We thought it would just be ice or slush so skipped. That was a stunning hike and I'm up for doing the Picheru loop starting and finishing on the Val side, next. @bar shaker, any idea what is happening on the nursery slopes. The front de Neige webcam shows a huge amount of work going on. La Daille webcam has been down for a few days now but I presume the new lift is progressing. The La Daille camera is back up and working. They've been working at a good rate and were lifting the big red main pulley wheel on, on Monday. Today much more steelwork is in place. There's still a lot to do but having good weather is helping them. The work you can see on the Front de Niege is the re-development of the Hotel Brussels. @bar shaker - thanks for posting that hike - is the road suitable for a road car or 4x4 only up from Chevril to the lower lake Sassière? We’ve got the dog and can’t go into certain areas (like over Col du Palet into the National Park - real bummer as we can’t use the refuge). Any other good dog-hikes (hardy retriever) around Tignes/Val? Thanks, I knew the Brussels closed at the end of the season for a refurb/expansion but didn't realise it was quite so extensive. They are making some mess! @Timg60, Also saw a Snoworks post today about the removal of the Grand Motte gondola car. Some serious investments across the EK in the last few years. It's really changed! Still haven't booked yet but Tignes next March is looking likely. Any recommendations for 'cheap' HB hotels in Val Claret not too far from the lifts? We've been looking at the Diva hotel. In little pieces I expect. It should be easy enough to drive up in an all-terrain truck, roughly along the line of les Lanches lift, Google maps shows some tracks. 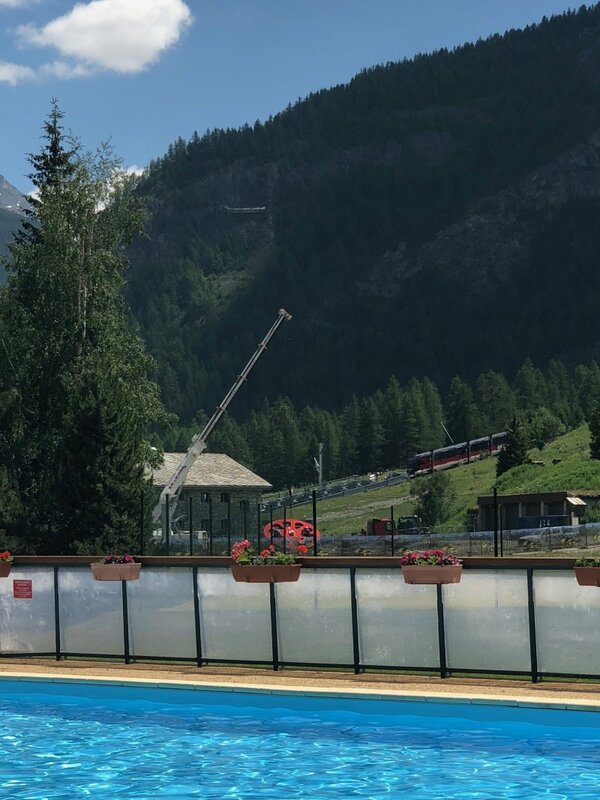 Tignes Pro site says the top station of the Sache Gondola is completely destroyed. No reason given. Had it been the old La Daille gondy the whole of the FD would be gone - which is why the new one has a separate top station. @HoneyBunny, Had mates stop in the Diva - now known as Belhambra I believe. It does what it says on the tin at a reasonable price. Almost ski in out. Buffet style nosh - not Haute Cuisine but lots of it. Close to the new Coco Rico Nouveau . Just got into le Dauphine - seemingly a "torch being used to dismantle some beams set fire to the wooden floor which then propagated to some 'pads' (orange cushions??) stored in the basement"
We stayed in the diva a few years back. For a TO last minute (€410) deal I thought it was a steal. Ok food and a very handy location. At the right price I’d go for it. When I stayed there we had the best conditions I can remember. It snowed for 2 days before we arrived, cleared up for a bluebird first day, then snowed the next three nights, 12-18” per, each day being either light cloud or bluebird. Four days of fresh tracks down Stade in the morning. If only booking the Diva would result in that again I’d pay waaaay more. @chocksaway, @rogg, thanks guys - yes the location does look good. A short stagger from the new Cocorico indeed! Shame it's not as cheap as 410 Euros though, what a bargain. For chalet seekers in Tignes Chalet Tournavel (Sauterelle for the last few years) has now been taken 'in house' by the British owners. However, it will be staffed by Paul and Lorraine who have run it for the last 5 seasons. Its just on the right before entering Val Claret (opposite Chartreux) so very peaceful but close to the bus stop to access everything else. Interestingly you can do the full chalet thing or if you take the whole chalet both a simpler catering option or self catering with your shopping done by the hosts is available. Free outside parking is also a big attraction for the self drivers. Back in Tignes! We arrived late on Wednesday, sadly yesterday was miserable and very rainy after a bit of triv in the morning. However today was warm and sunny - so Tigski and I ventured onto the lake this morning on stand up paddle boards and didn't fall in, which was nice! The village is very busy, summer tourism seems to increase every year. There is a lot of building work going on as well, a plethora of cranes and 'chantiers' abound. You can also see the fire damage on the old Brev bubble top station - not far from the top of the Boisses one. That's about as full as I have seen the Lac du Chevril. And as for the hole where the Alpaka used to be - its colossal! Anyway the wine festival starts tomorrow, so maybe less exercise and more drinking! Will your new boots take you up the hill above the funicular? There is a huge level square of ground being worked on, visible from the Tov webcam, bigger than lots of tennis courts. Would love to know what it is. Rumour is that it is going to be a new football (sports) pitch to replace one that will be disappearing when the building work starts on the new Club Med site and surrounding area. Will try to confirm if this rumour is true. I wasn't far out. It is going to be the new rugby pitch. Another glorious day, so another paddle boarding and walking day. As its Saturday there are lots of comimgs and goings and frustrated navette drivers as folks seem to be incapable of parking in the free car parks. As we had an early afternoon tea RV the walk was quite short today, so we went up the Tov Gondy and walked the Fresse ridge and down into VC. Seems that STVI are getting on well with the La Daille 21st Century transport! Not sure whether the concrete mass is the gondola storage or an extension to FD. Yes, I had to google Biotope and Biocenosis - things seem to have moved on since A Level biology! Toodlepip - time to walk to La Ferme for a large steak and a bottle of something red. Great updates and pics, thank you. An awful lot of work is going in Tignes and Val, the area is changing all the time. I won't recognise the place next time I go!! Don't fancy being a ball boy on the down hill end of the pitch, bit of a hike down to the funi entrance. Thanks for the updates. We're out at the end of the month but next summer I'll try and remember the dates of the wine festival. Great report @chocksaway. Happy hiking. @chocksaway, . Nice report and photos Mike. I've sent you a message but not sure if you've got your UK mobile with you. A great afternoon in the sun and fine dining at Lo Terrachu. Hic! Something very Floydesque about an outdoor kitchen near a French lake (or even James Martinesque). And then one of those incongruous moments, as we wandered through the snowpark we found a geese and chicken farm by the Snow Park staff hut, so its the Good Life in the Summer and Park (and pot) Life in the Winter. After a quick shower it was then time for a surprise 50th - guess who? Here's the man himself - what you can't see is how wet he is - it poured down just after we got back - fair play to Roccos Dutch Mate who got him to go out for a walk in it!